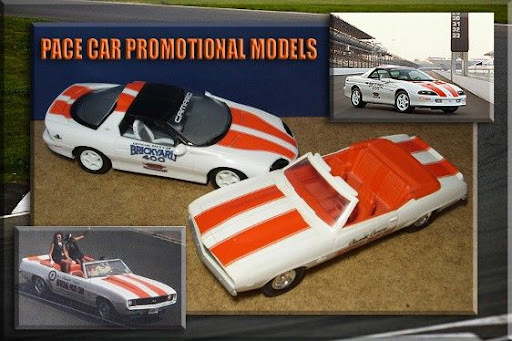 Since the Daytona 500 is this weekend, and I'm feeling kind of racy, it seemed like a good time to take a look at some pace car promotional models. Plus, I Photoshopped all these picture montages, and they were sort of going to waste on the tiny format, popup-riddled Examiner page, so let's revisit them here. If you're a scale model collector, pace car models may be a good place to direct your attention. Pace cars are interesting in-and-of themselves. They also fit in if you collect racecars or other racing memorabilia. And in the case of the examples shown here, they can be right at home in a promotional model collection. Pace cars have a special quality anyway. They're usually designed and decorated by an auto manufacturer to not only look official, but to promote the car itself. Sometimes, they're a one-off scheme just for a particular race or series, but in the case of most Indy 500 pace cars (and a few others), replicas are sold to the public on a limited basis. Of course, we've noted before in this column that scale promo models are usually released by the auto manufacturers to showcase a particular car or color scheme. Pace car promos promote (for lack of a better word) a car that itself was built to promote something in 1:1-scale. As you can no doubt tell, this is all very exciting. 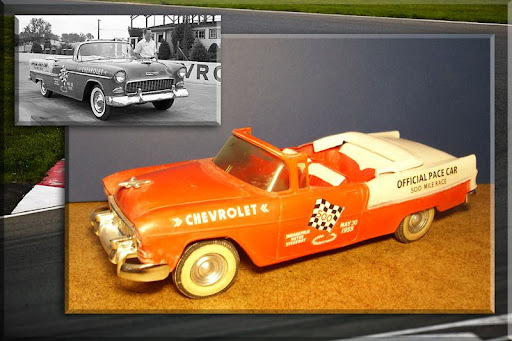 As far as I can tell, the earliest plastic pace car promotional was the 1953 Indianapolis 500 Ford convertible, built by AMT in 1953. This either came as an assembled promotional model from the dealership, or as an unassembled kit. 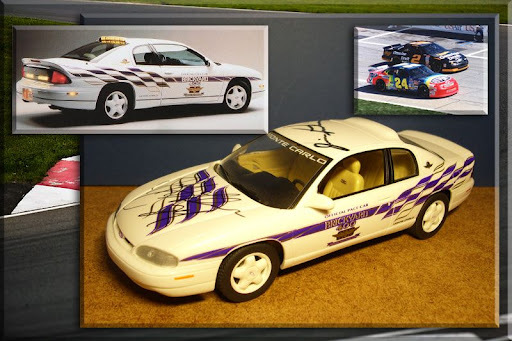 It was a crude model with crude graphics, but at the time the idea of a pace car replica had to be pretty special. Over the years, many pace cars have been released. Everything from Mustangs to Chryslers; Oldsmobiles to Vipers. But the most common subjects for pace cars are also the most common subjects for dealer promos in general--Camaros and Corvettes. When you look through the slideshow below, you'll see several of them, and they don't even scratch the surface. There are still some very recent examples of Corvettes available out there today, although there hasn't been an official promo model of the 2010 Camaro as of yet. Thanks to their unique graphics and ties to motorsports, pace cars are popular collectables. There are clubs and shows dedicated exclusively to this little sub-genre of the automotive world. Likewise, there are collectors out there who collect everything pace car, who surely have a few promos in their display. If you are looking to add to your collection, or if you are just getting started and want to collect something that has some teeth but won't overwhelm you, check out the garage sales, swap meets, flea markets, and online auction sites for pace car dealer promo models. You'd be surprised how addictive and satisfying a collection like this can be. If you click on the little dialogue box in the bottom left corner of this slideshow, you'll be able to read the captions that relate to these pictures.